Wacom is surrounded by creativity, so it should come as no surprise that one of Wacom’s own, Elizabeth Rhodes, is about to launch a new children’s book that creatively approaches the subject of feminism. She hopes Feminism is for Boys teaches parents and their children, both genders, that embracing feminism is important for all concerned. We had a chance to ask Elizabeth about her upcoming book. Wacom: How long have you worked at Wacom and what is your current role at the company? ER: I have worked at Wacom for 3 years as a User Experience Designer. Mainly my focus is working on the web presence of product launches and external websites and campaigns. Wacom: What inspired you to write Feminism is for Boys and is this your first book? ER: A little more than a year ago I became a mom to a strong, silly, wonderful daughter named Alora. When she was born, my partner and I ensured she had a collection of books that helped to teach her about feminism. We had books like Feminist Baby, Little Trail Blazers, The Paper Bag Princess, I Look Up to Michelle Obama and the Little Feminist collection. It was important to us that she understand equality and what it had to offer her. Many of my feminist friends have, or were having, boys and a few of them weren’t quite sure how to empower their child to participate. We also found that many adult men were confused to the meaning of feminism, thinking it was a movement for women (and often thought it was against men). In our family, my partner was the first to consider himself a feminist. He understood the importance of gender equality, for himself and for others. He knew that gender equality meant that he too got to be the best version of himself, free of gender expectation. He understood that feminism could support a healthy version of masculinity. Overtime, he would help open my eyes to what feminism was. He would help me recognize where the culture was failing us, and how we could change our inner voice and outer actions to resist that negativity. 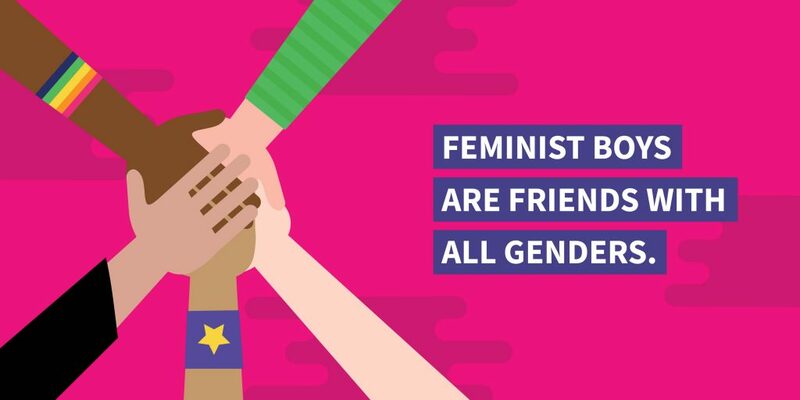 So, when we had our daughter and found this disconnect between feminists and the boys or men in their lives, we wanted to do something to help close that gap. 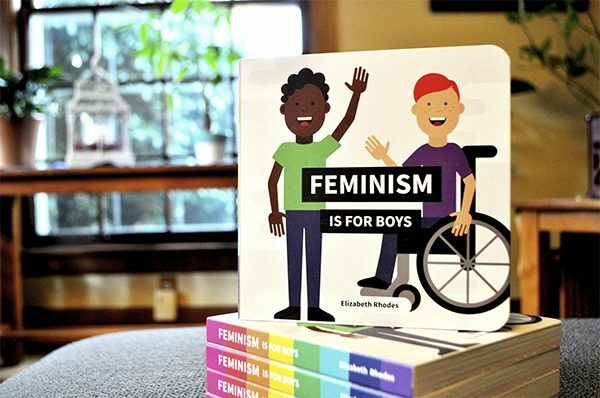 We decided to create this book in an effort to help boys and men understand how feminism can support their equality (just as much as it does others) and normalize the idea of a man or boy identifying as a feminist. Feminism is for all genders that believes in equality, including boys. Yes, this is our first book, but are hoping to eventually do more. Wacom: Is there a particular target audience for the book? ER: 0-3 of all genders. We really hope all parents will find this helpful in teaching their children (of all genders) that there are many healthy ways to be a boy and all of them can be supportive of equality. Wacom: Are there any key lessons you hope people come away with after reading this? ER: I hope that this book helps to spark conversation and discussion in families around gender. I hope it helps to show children that boys can have interests that include things like playing sports with girls, cooking, playing with dolls, and wearing dresses – and these are all acceptable versions of a boy. I hope that it helps to show that boys can express emotions like sadness and fear without shame. I hope that it helps to show that boys can and should be friends with other genders. Most importantly I hope that it helps to show that boys can believe in equality for all genders and proudly call themselves feminists. Wacom: We understand you also illustrated the book, correct? ER: Yes. This was the main reason I decided to tackle a children’s book. Illustration has always been a passion of mine, and a children’s book seemed like a really fun way to use my talent to help solve a problem. Wacom: Is there a certain illustrative style used to help relay the message(s) of the book? ER: I chose to do a very simple, bright, and fun “flat” illustration style. This particular style is something I use often in icon work to help quickly relay an idea, getting a user to understand meaning sometimes without reading the accompanying text. I felt this style was the best way to help children instantly understand the message, even when complex words were being used like “feminist” and “gender”. Wacom: Was a Wacom device used to create your illustrations? If so, which product and how did it help with the whole process? ER: Yes, I used the Wacom Intuos Pro. This product has been very important to the work I’ve done. Illustrating can often be tedious work, but with my Wacom product it made everything so much quicker, precise, and easier overall. For me personally it also helps ease the strain on my hand, allowing me to do far more without tiring. As this project was something I’ve taken on during weekends and during Alora’s naps, it was extremely important to have the proper tools to accomplish my goals. Wacom: When will the book be available to the public? ER: The book is currently available via Amazon and at some smaller book stores such as Powell’s in Portland, Oregon. Wacom: Is there another book in your future? ER: Officially, not yet. My partner and I have a few ideas but want to fully invest our energy into the success of this book. Hopefully Feminism is for Boys will be successful enough to open up more opportunities for us to pursue additional projects related to our activism.